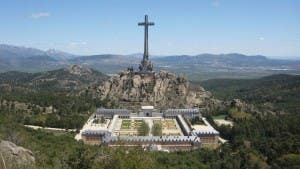 THE world’s tallest cross soars 150 metres above the pine forests and granite mountains of Sierra de Guadarrama, 30 miles from Madrid. The imposing basilica at Valle de los Caidos’ (Valley of the Fallen) marks the final resting place of General Francisco Franco and Falangist Party founder Jose Antonio Primo de Rivera. It’s an idyllic location stained by history and the atrocities of war. For here, too, lie the remains of some 40,000 civilians and soldiers, many of them Republicans executed by Franco’s cruel regime, transferred to the site on his orders and buried beneath the valley floor. In a final bitter irony, they are interred alongside their hated enemy. And, 40 years after Franco’s death, Spain is yet to agree on what to do with this most visible symbol of his dictatorship. Franco claimed it was intended only as a ‘national act of atonement’ honouring the civil war fallen. But many regard it as a monument to an assassin. And it has also been compared to a Nazi concentration camp for the use of prisoners of war in its construction. The site, and its monastery of 23 Benedectine monks is managed by Spain’s National Heritage, the Patrimonio Nacional. According to the monks’ registry, the bodies of at least 33,847 Nationalists and Republicans from the Civil War are buried here. Every November 20, the anniversary of Franco and Primo de Rivera’s deaths is marked with a mass at Valle de los Caidos’ cavernous Benedictine Abbey. Part-Falangist rally complete with stiff-armed fascist salutes, it is a remembrance ceremony held in a Catholic church to a dictator who, according to historian Paul Preston, executed 120-150,000 Republicans, burying them in hundreds of unmarked graves across Spain. 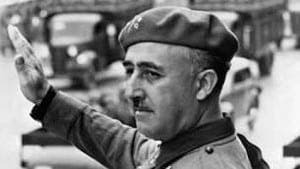 “Franco was the greatest Spanish assassin and the greatest Spanish criminal of all time,” historian Ian Gibson told the Olive Press. “The rising against the Republic was a terrible crime. Spain is behaving disgracefully. As a Spanish citizen, I have a moral duty to speak out. Despite these associations, Valle de los Caidos’ popularity with tourists endures. Figures supplied by Patrimonio Nacional show 240,837 people visited in 2014, while in 2013 it was their third most visited site in Spain. The crypt, declared a basilica by Pope John XXlll in 1960, is larger than St. Peter’s Basilica in Rome. Commissioned by Franco to equal ‘the grandeur of the monuments of old, which defy time and forgetfulness’, on 1 April 1940, the dictator detonated the first blast of dynamite as excavation began. For the next 18 years, thousands of Republican prisoners – and more right-wing volunteers – were forced to dig their conqueror’s tomb and adjacent monastery from the bowels of these hills. Nicolas Sanchez-Albornoz was one of these prisoners. In 1948, the 20-year-old Republican student was sentenced to eight years hard labour at Valle de los Caidos, before managing to escape. 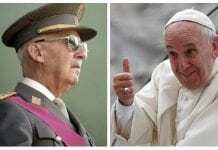 “I think the first thing to do is get rid of the symbolism, which is the fact Franco and Primo de Rivera are buried there,” the 89-year-old told the Olive Press. “You have to move their bodies to another place. Get rid of the civil war symbolism and the monastery, which is there to provide for the soul of Franco. Ahead of December’s general election, PSOE leader Pedro Sanchez has pledged to remove both bodies and to ‘urgently apply a new character to Valle de Los Caidos’. But for Jaime Alonso, Vice-President of the Fundacion Nacional Francisco Franco, Valle de los Caidos is a unifying memorial. Since 1976 his organisation has dedicated itself to preserving Franco’s memory. He sees no contradiction in Republicans lying buried alongside their enemy. 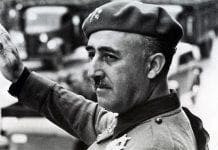 “Franco is the most important man in the history of Spain since the Catholic kings,” he told the Olive Press. “Valle de los Caidos is a monument created for reconciliation, a monument that for any Catholic is a sacred place where the bodies of the fallen lie. “After death, enemies don’t exist. Enemies are before, in life. In Spain, years later, there are adversaries, or people who think one way or another. Emilio Silva Barrera, journalist and co-founder of the Asociación para Recuperación de Memoria Histórica, is one of those grandsons. 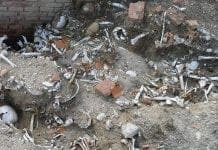 Since 2000, his organisation has helped families exhume the bodies of loved ones buried in mass graves during the civil war. His grandfather, Emilio Silva Faba, was among the more than 1,300 bodies they have recovered. He was executed in Leon by Franco’s soldiers along with 12 other Republicans in October 1936. Barrera located and recovered his body 74 years later. “There are thousands of Republicans buried at Valle de los Caidos,” he told the Olive Press. “It is perhaps the only monument in the EU where a dictator is buried in a tomb paid for by his victims. 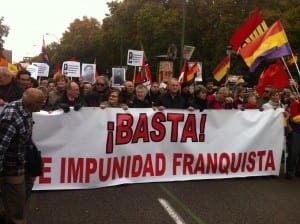 This November 22, on a bitingly cold Madrid Sunday, a 1,000-strong protest of relatives of those murdered by Franco’s regime stood in silence, fists raised defiantly in the Republican salute as they demanded justice. for their loved ones. Four decades after Franco’s death, Valle de los Caidos is crumbling as damaging leaks seep through its once impenetrable stone armour. Architect Diego Mendez designed his towering cross to withstand a hurricane. Could the political winds of change eventually tear it down? Would make good road building material – a road to take Spain into the present age and away from the past. Stewart, but the real challenge is, to drive him out of the hearts of his followers and beneficiaries. It is a startling and impressive monument , product of a specific epoch, built very expensively in a time when much of the Spanish population lived in slums and poverty was widespread. I don´t think that would be a good idea demolish it. It´s an historical monument, a sad memento for the future generations. And i think that the politicians must be dedicate to the fight against the economical crisis and the corruption. ….and to let to the deads to rest in peace. I think this review of the Valley of the Fallen that I read sums up the place. we know you are a Fascist, every post of yours is proof positive. Stuart: The fascism is very well explained in the book of this same title, wrote by Stanley Payne. Please before to call someone as fascist, would be better that you´ll read that book. I think that is bad to destroy monuments, and that is good that monuments can serve for to the teaching of the future generations. And we have seen a proof of it in the commentary of John R. He says he have been badly impressed . It´s natural that a monument that represent a totalitarian regime and commemorates a bloody civil war would be not a pleasant place.